The SSG Matthew Pucino Memorial Foundation, Ltd provides for the emotional and physical needs of combat wounded soldiers and their families and to the families of the fallen. 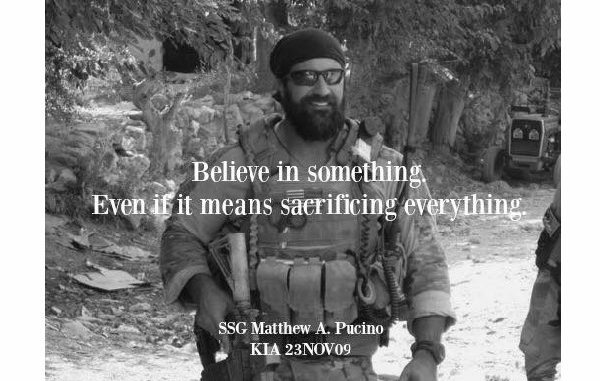 Matthew Pucino died at the age of 34 in November 2009 in Afghanistan while deployed with his Special Forces detachment. He joined the Army shortly after the terrorist attacks on September 2001. Upon completion of his initial training and graduation from the Special Forces Qualification Course (SFQC) he was assigned to the 5th Special Forces Group based at Fort Campbell. While with 5th SFGA he deployed to Iraq twice on Operation Iraqi Freedom (OIF). He then left active duty and joined the 20th Special Forces Group (National Guard) and was assigned as an Intelligence Sergeant to an SF ‘A’ detachment. When not deployed or training with the 20th SFGA he worked as a contractor for NEK Advanced Securities Group and deployed to combat zones in support of DoD programs. The SSG Matthew Pucino Memorial Foundation conducts a number of fund-raising events that benefit the foundation’s projects. These include an annual golf tournament, an annual motorcycle ride (see Blackbeard’s Ride), and special events like the Night of Excellence recently held in Boston, Massachusetts. The staff at SOF News is very familiar with the foundation – it is a class act and an organization worthy of your support! Photos: The top image used with the permission of the SSG Matthew Pucino Memorial Foundation. 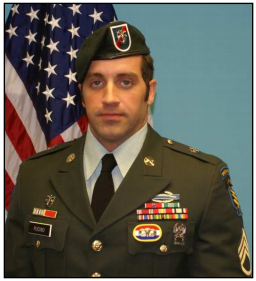 The second photo of SSG Pucino is from the United States Army Special Operations Command (USASOC) Memorial Wall.